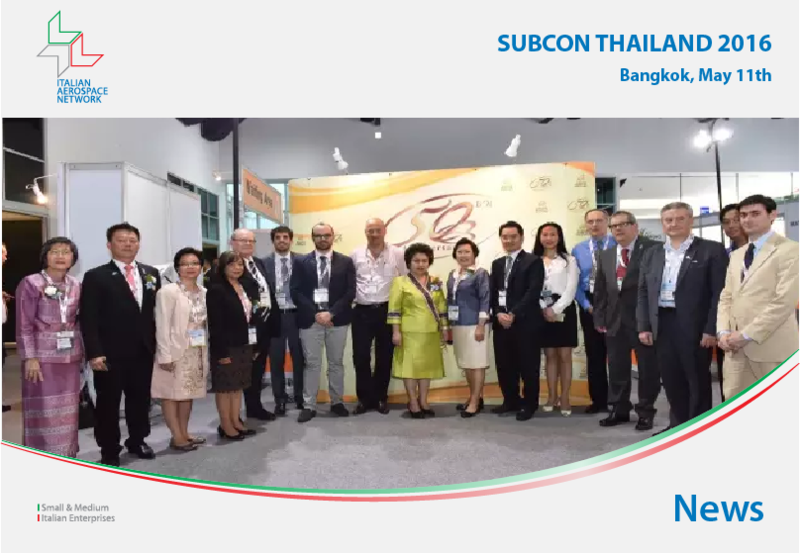 From May 11th to 14th, 2016, Italian Aerospace Network attended SUBCON THAILAND 2016. The event, co-organized by the Thailand Board of Investment (BOI), the Thai Subcontracting Promotion Association UBM Asia (Thailand) Co., Ltd. and BOI Unit for Industrial Linkage Development (BUILD) reached its 10th edition by covering a total exhibiting area of 6.000 sqm. IAN, represented by a delegation lead by its Italian Coordinator Mr. Erminio Zanenga, met the Minister of Industry of Thailand, Ms. Atchaka Sibunruang, the Deputy Secretary General of the Thai Board Of Investment, Ms. Ajarin Pattanapanchai and the most important technology oriented enterprises. The relationships between IAN and BOI were born in 2014 in Italy, during an official visit of the BOI, and have efficiently nurtured over the past two years throughout several business and institutional activities. IAN is glad to be the Italian aviation partner of Thailand and works hard in order to create the basis for a long term fruitful relationship between Italy and Thailand.